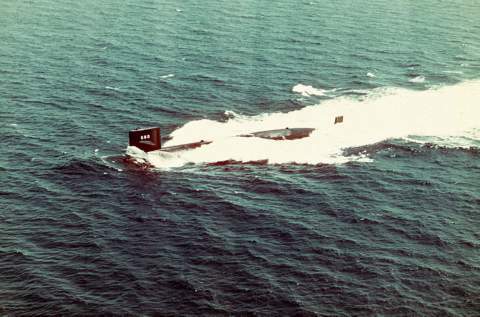 The second Sand Lance was laid down by Portsmouth Naval Shipyard on 15 January 1965; launched on 11 November 1969; sponsored by Mrs. Thomas J. Mclntyre; was placed in service on 4 January 1971; and commissioned on 25 September 1971, Comdr. William A. Kennington in command. On the day of her commissioning, Sand Lance's home port was changed from Portsmouth to Charleston, S. C., and she spent the remainder of the year on shakedown. Sand Lance operated in the Charleston area for the whole of 1972; and, in February 1973, stood out of that port for special operations. She returned to Charleston on 21 April, remained in port until 11 June, and departed again on special operations. She completed these operations in August and put in at Fas-lane, Scotland, on the 13th. Sand Lance left Faslane on 20 August and arrived in Charleston on 5 September. Sand Lance has continued to operate out of Charleston, in the western Atlantic and in the Caribbean, since then. As of June 1974, she is in port in Charleston. Sand Lance (SSN-660) under construction at Portsmouth, with temporary safety railings rigged around her deck. The external difference between this new generation of submarines and its predecessors is readily apparent, and almost as marked as their internal differences. The external fairing on the lower hull is temporary, designed to provide added buoyancy for the bow during the launching and to avoid excessive strain on the hull.